AMB. KATUREEBE TAYEBWA CALLS UPON UGANDAN WOMEN LIVING IN MOMBASA TO FOCUS ON ECONOMIC DEVELOPMENT. 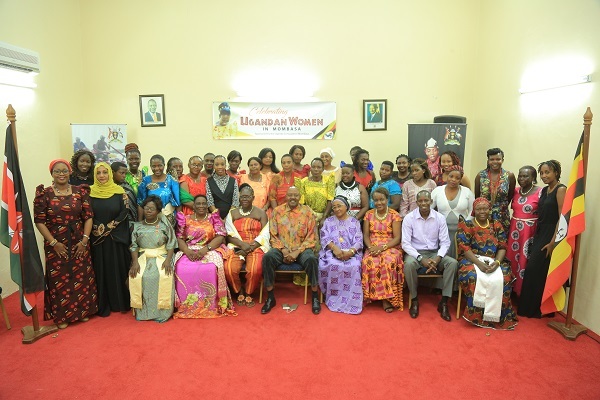 The Consul General of Uganda Consulate in Mombasa, Ambassador Katureebe Tayebwa, has called upon the Ugandan Women Living in Mombasa to mobilize themselves and form an association that will empower them further in their livelihoods and business. Ambassador Katureebe informed the gathering that this event was one to recognize and empower the role the Ugandan Women in the diaspora of Mombasa to contribute to development back home. He called for closer cooperation between the women and the Consulate and that the Consulate was here to work with them in all aspects and ensure their wellbeing in Mombasa. The event was the first of its kind and included women from different sectors and backgrounds that included professionals, farmers, entrepreneurs, lawyers and those in the restaurants business and small scale enterprises. The events of the evening included showcasing of different cultures in Uganda, and discussed challenges encountered by women in the course of doing business. It was resolved to hold more engagements to address pertinent matters relating to consular (dual citizenship, national identification), what is expected of a person living in a foreign country and most importantly issues to do with economic development and women empowerment. The meeting further agreed to intensify lobbying to bring men on board so as to have a united front in pushing for their interests.